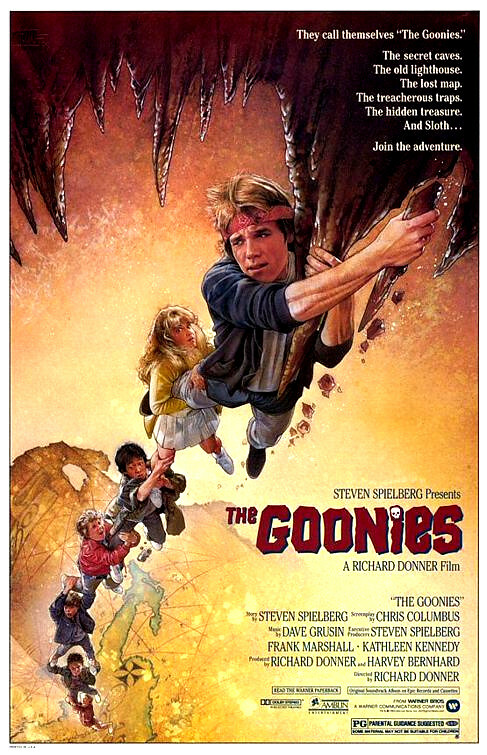 If I’m not mistaken, I believe that this is the official release poster that accompanied the film in its original theatrical run. It’s at least the version that I remember seeing in newspaper ads and on the album cover of the soundtrack release back in the 80s. 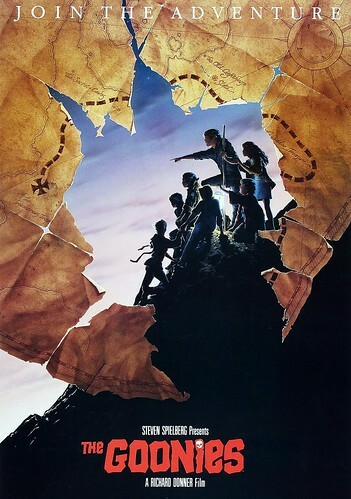 Even though Struzan’s work tends to be kind of static with its photorealism and posed layouts, this piece has always stood out as one of his more exciting concepts. 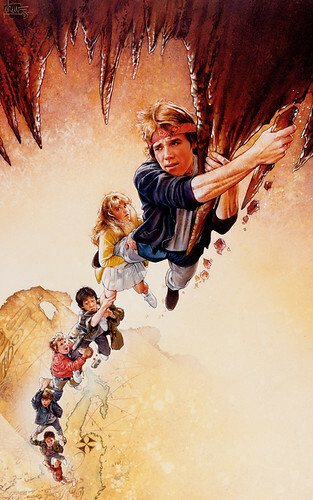 Hanging precariously off of the stalactite, this group shot really sums up of the film in a lot of ways. 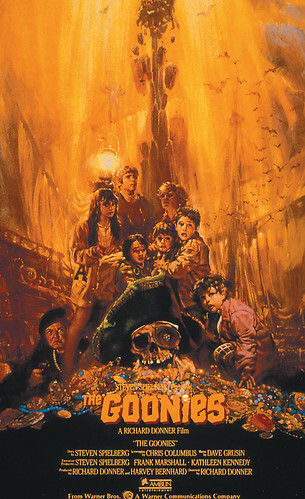 Aside from a good chunk of Raiders of the Lost Ark, the Goonies was the first film that really kept me on the edge of my seat where it always felt like there was never any stable ground for the characters between all the slippery log bridges, cavernous waterslides, secret fireplace escapes, faux James Bond zip-wire shenanigans, and the collapsing flooring around the creepy bone organ. This poster really nailed that feeling for me. Alvin, like Struzan, has a ton of memorable movie poster artwork to his credit including the posters for Bladerunner, the Gremlins, Legend, Darkman, Aracnophobia, E.T., the Lost Boys, Willow, and Young Frankenstein. 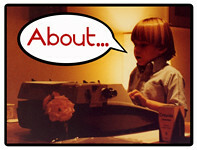 Most people probably don’t know his name, but I’d be willing to bet they gave fond memories of his work. 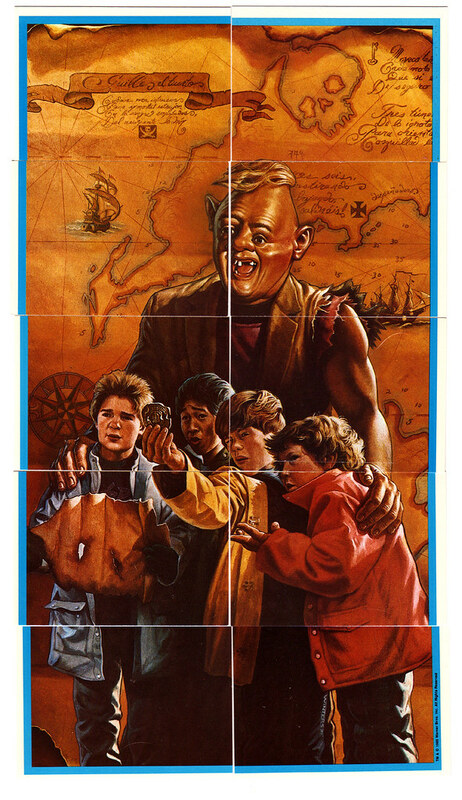 His take on the Goonies is a bit more whimsical and mysterious; it almost has a Peter Pan kind of vibe to the tone and characters. One of his artistic tropes was the use of silhouette, and personally I think it went to good use with this poster. I also enjoy the way he framed the poster with One-Eyed Willie’s treasure map, not only to being in that plot element, but also to bring in the main color palette of the film. PreviousCelebrating 25 years of the Goonies!